Baber during halftime told the players the importance of accuracy and the need to connect their pass­es all the time. 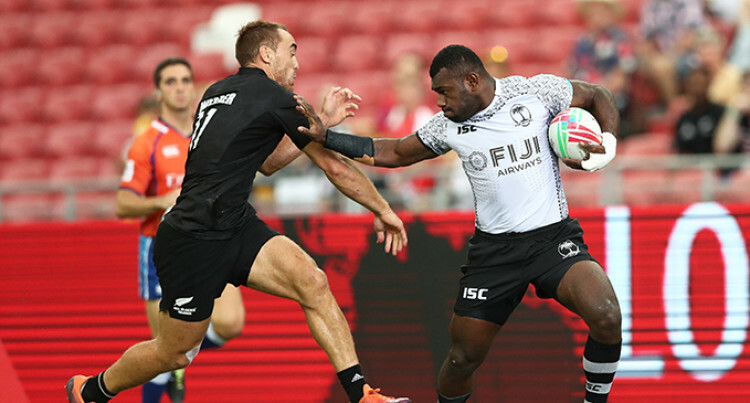 The Fiji Airways Fijian 7s team bounced back to upset favourites New Zealand 19-5 in the Cup quarterfinal of the Sin­gapore 7s yesterday. Coach Gareth Baber made posi­tional changes with Livai Ikan­ikoda being moved back to half­back, Vilimoni Botitu manning the playmaker’s berth while Sevuloni Mocenacagi played at rover with Josua Vakurunabili joining the for­wards. The Kiwis started strongly with a try to Tim Mikkelson which was not converted for a 5-0 lead. The Fijians struck back when Aminiasi Tuimaba pulled in two defenders before offloading it to Vakurunabili for a try in the corner as the scores were tied at 5-5. The Kiwis were unfortunate when Meli Derenalagi was denied a try by the referee and resulted in Boti­tu copping a yellow card for tapping the ball away. However, sensing an upset win, the Fijians kept applying the pres­sure as the Kiwis were reluctant to commit themselves and a long pass to Regan Ware being ruled forward. From the scrum Ikanikoda pow­ered his way past Kurt Baker and Akuila Rokolisoa to score the sec­ond try before adding the conver­sion. New Zealand had a chance to score their second try but Rokolisoa lost the ball forward while on the try-line. In the second half Botitu ran away from a Sam Dickson tackle to score the third try with Ikanikoda land­ing the conversion from far out. There were a number of errors committed by both teams as they failed to register any points.